Activision today officially confirmed the videogame adaptation of the upcoming James Bond film "Quantum of Solace", and launched a teaser website to promote the title. Activision's teaser website gives fans access to some early concept artwork from the locations featured in the game, as well as the opportunity to sign-up to the community to vote on polls and ask the development team questions. This site will serve as the hub of activity for the game and will be updated on a regular basis. "Built for Next-Gen, 00 Status Achieved. Bond is Back. From Casino Royale to Quantum of Solace... and Beyond!" Tucked away in the website's banner is confirmation of long running rumours that the game will feature action from the 2006 film "Casino Royale" as well as the 22nd movie "Quantum of Solace". Locations from both films are cited on the teaser site, including: London & outskirts (UK), Venice (Italy), Lake Como (Italy), Siena (Italy), Montenegro, Austria, Miami (USA), Madagascar, and Bolivia. 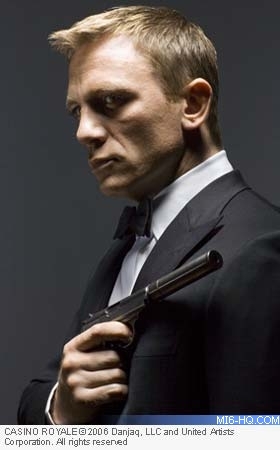 Above: Daniel Craig in Casino Royale. Development studios are confirmed as Eurocom, Treyarch, Beenox and Vicarious Visions. The game will be released this Fall. Treyarch are understood to be heading up development on Xbox 360 and PlayStation 3 consoles, with Beenox producing the Nintendo Wii version, and Vicarious Visions working on the hand-held platforms. Eurocom are understood to be developing the PC version. Speaking about Activision's direction with the 007 licence, Activision CEO Bobby Kotick said "Bond is one of the great videogame franchises of all time and that really was a result of GoldenEye 64. I think the key to re-energising the Bond franchise is going to be ultimately the highest possible game quality." Last November, Activision confirmed a second 007 title was also under development, later rumoured to be a racing game. Stay tuned for the latest news on the upcoming 007 titles from Activision on MI6 - the only James Bond site with extensive coverage of the videogames.